Perpugillium “Peri” Brown (Nicola Bryant) was an American student, who travelled with her stepfather who worked all over the world. She was the 80’s pinup Who girl and her inclusion in the programme was no doubt a nod to red blooded males, everywhere. She also looked rather good in a swim suit. Peri was a young, slightly naive – but no less caring and spirited girl who travelled with two different incarnations of the Doctor – (no’s – 5 & 6). Peri also had markedly differing relationships with each. It was on the island of Lanzarote, in Planet Of Fire – 1984 that she first met Turlough, who saved her from an unfortunate [nearly] drowning incident and brought her back to the Tardis, [unconciousness] to recover. She then met the Fifth Doctor and unfortunately for Peri, a rather small Master who was back and only three foot tall; due to some experiment with his own tissue compactor, which had gone wrong. She was hypnotised by the Master into helping him with his dastardly plan which involved destroying the planet Trion – to harness the recruperative abilities of Numaton gas – to return the Master’s ample stature. Peri was also harrassed by the Master’s ally, robotic shape changer Kamelion – who appeared to Peri in the form of her stepfather and the Master. After Turlough left, Peri became the main companion of the Fifth Doctor. They travelled to Androzani in Caves Of Androzani – 1984– where Peri and the Doctor contracted Spectrox poisoning; and the unwanted attentions of potential suitor – Sharaz Jek. The Fifth Doctor gave his regeneration (and nearly his whole life) to save Peri as there was not enough antidote left for both of them – and Peri got the dose. Her relationship with the newly regenerated Sixth Doctor was a strained affair, at best. Shortly after his regeneration (and suffering from post regen. stress), he attempted to strangle her to death. Their arguing and bickering detracted from the show somewhat and after a years sabbatical and threat of cancellation, the writers toned down the arguments in the Season long story arc – Trial Of A Timelord – 1986. 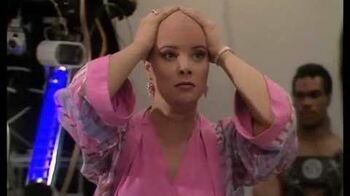 This was to prove to be Peri’s exit from the show, during the events of Mindwarp- 1986. Peri was forced to undergo brain surgery and had her brain swapped with a slug-like alien anthropod, called Kiv. Kiv and Peri - in one body! These events were debatable though, as they were played back at the Sixth Doctor’s trial, on Gallifrey – through the Timelord Matrix. In due course, it was discovered that the Matrix had been tampered with, by the Doctor’s prosecutor – The Valeyard. It turned out later, that in the real events – Peri had married King Yrcanos and settled on his home planet.